This is Masha’s new toy, a present from a visitor. Actually, she does use it for work. It’s the Russian version of the popular Keyboard for Blonds. This entry was posted on May 11, 2010 at 2:13 pm	and is filed under uncategorized. 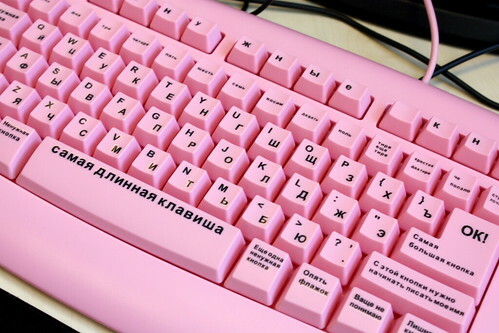 Tagged: humour, Keyboard for Blonds, Russian. You can follow any responses to this entry through the RSS 2.0 feed. You can leave a response, or trackback from your own site. You are so lucky!!! Enjoy. I had never seen this before! Went to the link….it’s hilarious! What a great, hilarious way to start my day! I am still giggling! No wonder you want one.